Uhg. It’s only eleven in the morning. Back to sleep I go. Noon? I could do a bit better. And then, at one, I rise. It’s cold. On the windows there’s condensation and I see the grass covered with frost. I shiver. Is it winter already? I put on a long-sleeved tee-shirt and a pair of track pants and head off to brush my teeth. Back and forth, back and forth. Up and down, up and down. Still tired, I creep down the stairs and have fried eggs with a bagel (also known as pure bliss). My dog scratches. I threaten to scratch him back if he doesn’t stop. He doesn’t stop. I scratch him back. Hmm… what to do next? I lie down on the couch and my Cavalier King Charles Spaniel lies on top of me. I feel warm as I watch a movie. I pet my dog and lie there happily in my family room. Life’s good. Around 4pm I realize I have an English assignment due and run to my computer. I stare at the blank word document before me and wonder how writers do it. Perhaps they use SparkNotes? “Macbeth is a bad person.” No, that won’t work. “Macbeth is a good person?” Probably not. Ah, screw it. I go back down to my family room and watch some more TV. I mean, that’s what weekends are for, right? Weekdays are a bit different for me (partly due to the fact that they involve a bit less lounging). Nevertheless, I look forward to weekday breakfasts because usually once a week soft-boiled eggs with toast strips are on the menu (also known in the UK as soft-boiled eggs and soldiers). I happily dunk my toast into the runny yolk, put on my heavy backpack, and tread sadly to school. Life’s much better on the weekends. 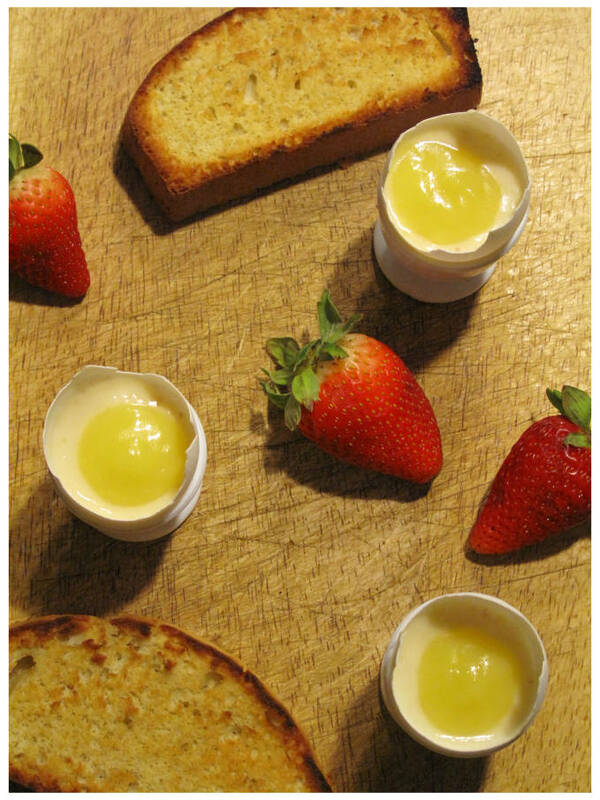 While this may look like a soft-boiled egg with toast, it’s really “Trompe L’oeil” made with Meyer lemon pudding, lemon curd, and cinnamon cake slices. 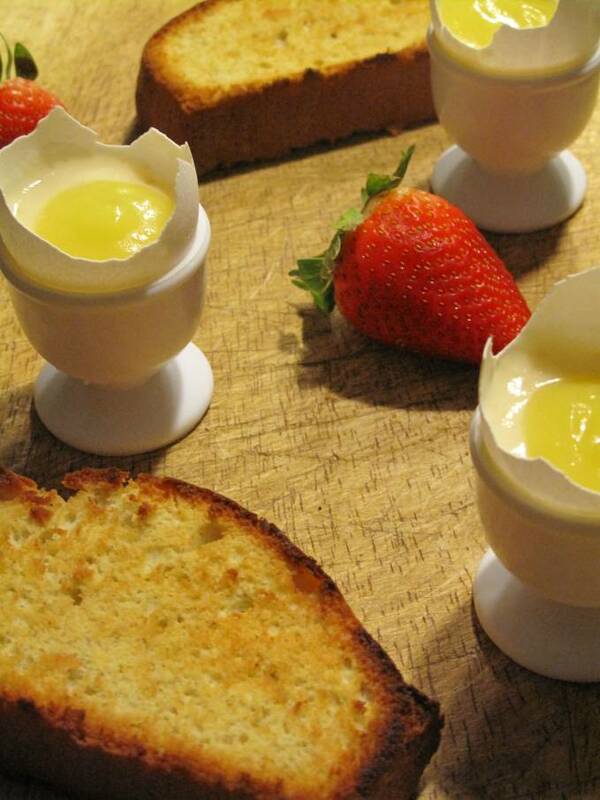 Trompe l'oeil "eggs with toast" with Meyer lemon pudding, lemon curd, and cinnamon cake. Use a sharp knife to lightly tap around the top third of each eggshell to loosen it. Remove the top of the eggshell with the knife, dump the eggs out into a bowl (reserve them for the lemon curd/lemon pudding/toast) and use the knife or your fingers to peel out any remaining bit of membrane clinging to the inside of the shells. Place the empty eggshells in a saucepan, cover them with 2 inches of cold water, add the vinegar and bring them to a gentle simmer. Gently simmer them for 15 minutes, then remove them with a slotted spoon and let them cool and dry. Store them in the refrigerator (in an empty egg carton or airtight container) until you’re ready to use them. Whisk together the cornstarch, sugar and a pinch of salt in a saucepan, then whisk in the milk. Bring to a boil over medium heat, whisking frequently. When the milk comes to a boil, continue whisking for another 2 minutes, until it is very thick. Remove the pudding from the heat and whisk in the lemon juice and butter. Pour it into a large bowl, place a piece of plastic wrap on top to prevent a skin from forming, and let it cool. Store the pudding in the fridge until you’re ready to use it. In a medium saucepan, whisk together the lemon juice, lemon zest, sugar and eggs. Cut the butter into bits and add it to the saucepan. Turn on the heat to medium-low and cook the mixture gently, whisking constantly, until it thickens up enough to hold the marks of the whisk and is just about to come to a simmer. This takes me usually around 20-25 minutes — better to be gentle than to curdle your eggs. The end mixture will be a buttery, creamy light yellow. Remove from the heat and place into a bowl to cool. If you think the eggs may have curdled a little, go ahead and strain it. Place a piece of plastic wrap on the surface of the curd to prevent a skin from forming as it cools. Store the curd in the fridge. Preheat the oven to 350 F, and butter and flour an 8x4x3-inch loaf pan. Melt the butter and set it aside to cool. Whisk together the flour, baking powder, salt and cinnamon in a bowl. In the bowl of an electric mixer combine the eggs and sugar. 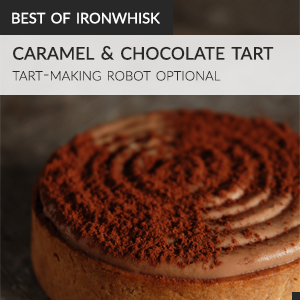 Using the whisk attachment, beat at high speed until the mixture triples in volume and is thick enough to form a ribbon that lasts about 2 minutes before dissolving — about 12 to 18 minutes. The mixture will be pale, pale yellow. Gently fold the dry ingredients into the batter into 3 additions. Add the cooled melted butter, and fold it in to incorporate. Scrape the batter into the prepared loaf pan and bake for 35-45 minutes, until a tester inserted into the center comes out clean. Cool the loaf for 5 minutes in the pan, then invert it to cool on a rack for 30 minutes more. Increase the oven temperature to 400 degrees F. After the loaf has cooled for 30 minutes, trim off the ends and cut it into ½-inch thick slices. Spread these out on a baking sheet and bake at 400 degrees for about 7 minutes, until undersides are golden brown. Flip the slices over and bake for another 5 minutes. 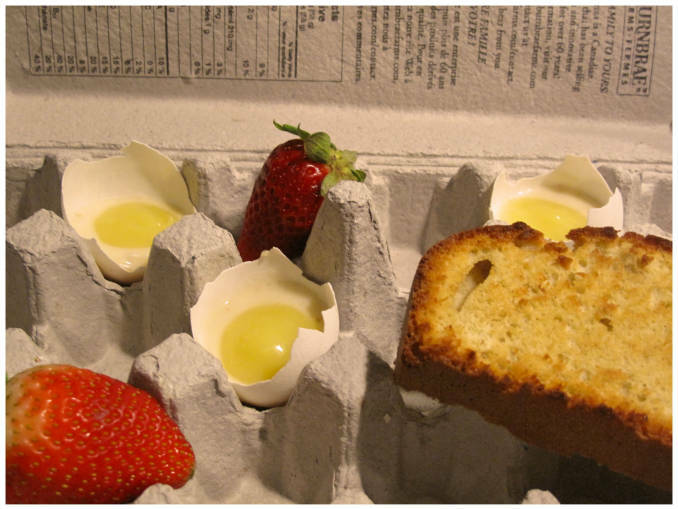 Arrange the eggshells in an empty egg carton or in egg cups. 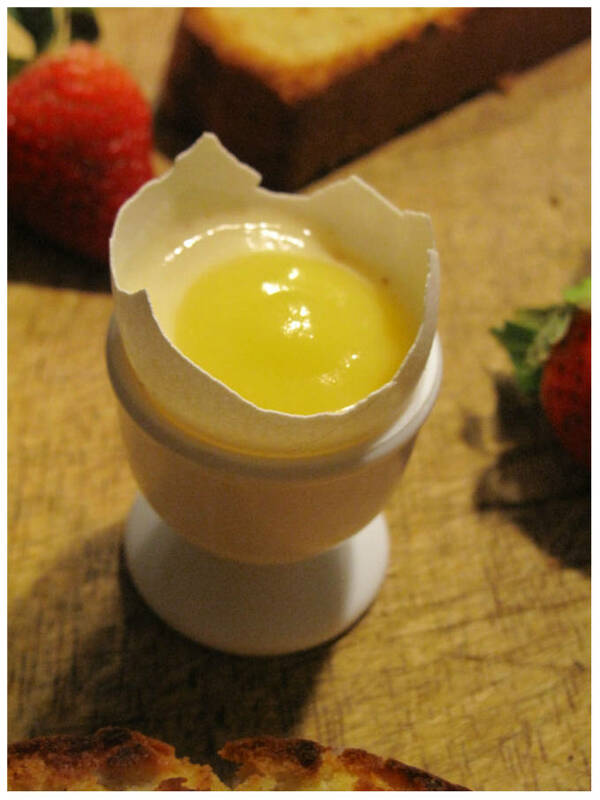 Spoon about 2 tbsp lemon pudding into each eggshell, then use your finger or a spoon to make a small well in the center. Put some lemon curd in a plastic bag and twist the bag firmly just above the curd. Snip off the corner of the bag to create a ¼-inch opening. Pipe about 1 tbsp curd into the center of each egg to form the “yolk.” Serve the eggs with spoons and the toasted cake slices. This would be a lovely breakfast to wake up to! Weekends are definitely only for lazing around the house in your pajammas, cuddling with your dog and watching tv! Macbeth can wait! :) Thanks for visiting my blog, I like yours as well!